The EK9300 PROFINET IO Bus Coupler from Beckhoff can connect different control networks with each other in a simple and efficient manner. This enables a PROFINET controller to exchange data with one or more EtherCAT, PROFINET, PROFIBUS and EtherNet/IP systems. Thus, the EK9300 can be used as a flexible gateway for real-time communication between these networks, with all the advantages provided by the EtherCAT network as an extremely high performance lower-level I/O system. The EK9300 Bus Coupler converts the telegrams from PROFINET IO to the EtherCAT “E-Bus” signal type. One station consists of an EK9300 and any number of EtherCAT Terminals. The coupler supports the PROFINET RT protocol and, therefore, fits seamlessly into PROFINET IO networks. from PROFINET to EtherNet/IP (with EL6652-0010). In this way, heterogeneous production systems can be networked by real-time communication without great effort and expense. For example, product-relevant management information can be collected in distributed units with different control systems or data can be exchanged in real-time between two PROFINET networks deliberately placed in different IP spaces. The EK9300 PROFINET IO coupler offers underlying connectivity to the high-performance and ultra-fast EtherCAT I/O system. 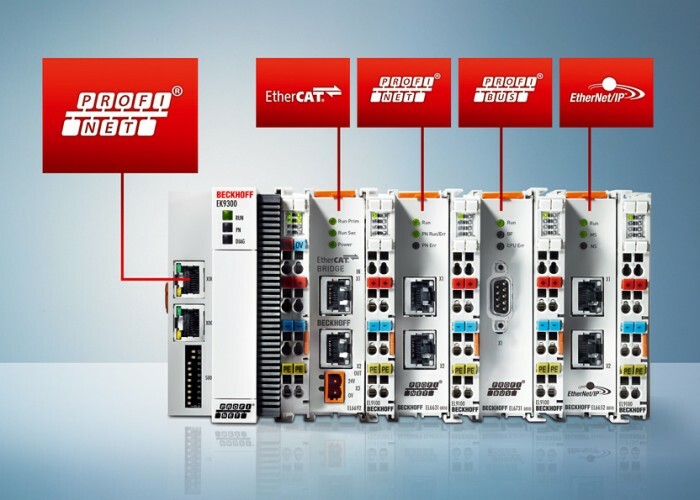 Particularly for widely distributed systems, additional advantages are gained because the EtherCAT network topology offers high flexibility and the ability to bridge long transmission distances of up to 100 m. Another key benefit is that the EK9300 Bus Coupler – in addition to its actual gateway function – supports the extremely wide I/O range of EtherCAT Terminals including numerous IP 67 box modules for installation in harsh environments. This allows the optimum mapping of the physical process on the one hand and on the other it allows the connection of a PROFINET controller via several EtherCAT slave terminals to the corresponding number of identical or different control networks. For more information, please visit http://www.beckhoff.com.